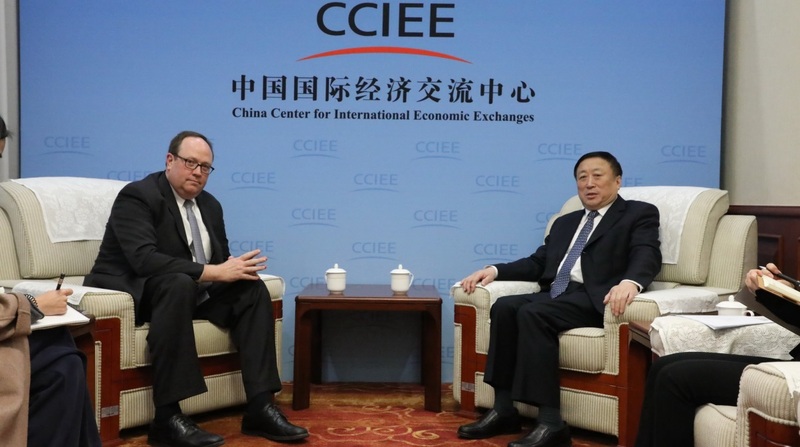 On November 28, 2018, Zhang Dawei, Vice Chairman and Secretary-General of CCIEE, met with Nate Tibbits, Senior Vice President of Global Government Affairs at Qualcomm. Staff from the Department of External Affairs of CCIEE and China Economic Consulting Corporation were also present at the meeting. Zhang Dawei said that the Sino-US trade frictions have had a great impact on the social and economic development of both China and the United States. CCIEE will continue to actively promote the exchanges between Chinese and American political and business circles to ensure healthy development of the Sino-US economic and trade relations. Qualcomm has played a positive role in promoting technology upgrades in China. CCIEE will create a better business environment for Qualcomm and other foreign companies operating in China and hopefully, Qualcomm can play a better demonstrating role in industrial development. Nate Tibbits said that Qualcomm highly appreciates the important role of the “US-China CEO and Former Senior Officials’ Dialogue” held by CCIEE, it will actively participate in the dialogue and contribute to the building of a sound Sino-US economic and trade relation. Furthermore, he also hopes that China will create a better business environment in the fields of intellectual property protection, innovation incentives, and industrial competition. The two sides also exchanged views on issues related to the artificial intelligence industry and Qualcomm’s industrial plans.